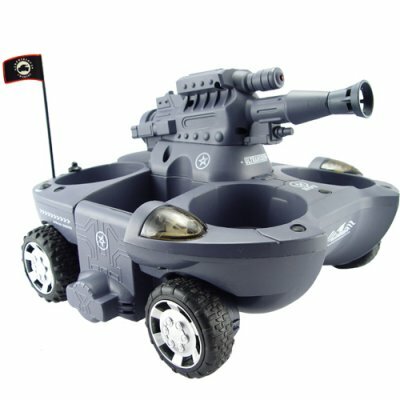 Successfully Added Radio Control Amphibious Transformer Toy RC Tank (110V) to your Shopping Cart. Radio Control Amphibious Transformer Toy RC Tank for a decisive battle victory every time! It looks like a prototype for conventional warfare in the year 2020! One minute it is an all-terrain carrier tank. Four surface compartments perfectly accommodate personnel, a video camera, or even four cans of pop too. It's quick, comes to a dead stop, and then changes direction making it absolutely ideal for recon work. Steer the vehicle to water and the spectacular fun really begins. Press a button and the four powerful wheels fold up and into the four surface compartments. Instantly you've got a powerful naval battle cruiser on your hands. The remote control features two thumbsticks for forward, reverse, left and right steering for true 8-directional movement as well as two special tactical buttons. The left one transforms the land tank to a water vehicle in an instant, but be careful with that right button. It's lethal. Press it and launch volley after volley of tiny pellets at your enemies! And there you go, you sunk his battleship! The default charger for this product is for 110V. If you need a 220V power adapter then order CVGN-T12-220V. Great care should be taken when firing the pellets. They can cause serious harm to body or objects because of the tremendous velocity which the projectiles are launched. Can this RC tank be used outdoors? YES. It loves the outdoors. Can it be used outdoors after it has rained? YES. It is an amphibious vehicle and has an underside which protects it from water. It should NOT however be used while it is raining, or else water could get into the battery housing on the top of the tank and ruin the inner circuitry.